308 pages | 3 B/W Illus. This volume tackles the critical question of whether people change or whether they remain relatively constant across the lifespan. Much existing literature in psychology has largely endorsed the concept of stability. Indeed, in many people’s minds, the person is understood to be set in stone, as a function of early socialization and reaching a particular stage of development, evolutionary processes, or traits that are hard-wired from the beginning by genes and biology. However, in recent years, important scientific developments in theory and research concerning the psychology of change have emerged. In contrast to the commonly held conception of the individual as fixed, this research illustrates how malleable people are—showing much behavioral plasticity. 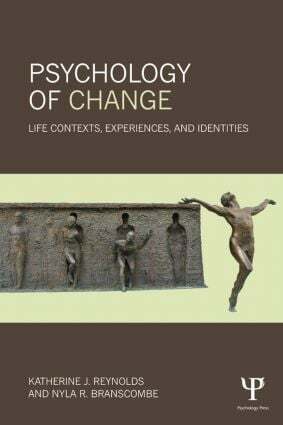 The chapters in this volume, written by scholars at the cutting-edge of research into the psychology of change, showcase these developments with the aim of advancing knowledge of the field and encouraging further research. Topics addressed include brain function, cognitive performance, personality, psychological well-being, collective action to achieve social change, responses to life stressors, and political change. The message is clear—the culture we live in, what happens to us along the way, and who we think we are and want to be, can all change people. Part 1: Broad Environmental Effects on the Person. Toward Person Plasticity: Individual and Collective Approaches, N.R. Branscombe, K.J. Reynolds. Experience-Dependent Effects of Genes: Responses to Stressors, O. McInnis, R.J. McQuaid, K. Matheson, H. Anisman. The Age in which We Live and Its Impact on the Person, J. Twenge. Psychological Metamorphosis: Understanding the Effects of Institutions, Roles and Dramatic Social Change on Individuals, S. Guimond, R. de la Sablonniere. Exposure to Political Violence and Political Behavior: Psychological Mechanisms of Transformation, D. Canetti, M. Lindner. Part 2: The Person Across Time, Contexts and Categorizations. A Functional Perspective on Personality Trait Development, D. Wood, J.J.A. Denissen. Emotion in Adulthood: What Changes and Why?, D.M. Isaacowitz, K. Livingstone. The Social Determinants of Cognitive Change: Identity Processes as the Source of both Enhancement and Decline, C. Haslam, S.A. Haslam, J. Jetten. Designing and Evaluating Behavior Change Interventions to Promote Health, S. Denford, C. Abraham, J. Smith, J.J. Lloyd, M. White, M. Tarrant, K. Wyatt, C. Greaves, S. Dean. Does Education Really Change Us? The Impact of School-Based Social Processes on the Person, K.J. Reynolds, E. Subašić, E. Lee, D. Bromhead, K. Tindall. Part 3: Shifts in Meaning, Behavior and Identities. Situations Change Thought and Behavior Through Metaphor, M.J. Landau, L.A. Keefer. Prosocial Behavior and Personal Change, L.B. Aknin. The Dynamic Nature of Identity: From the Brain to Behavior, D. Packer, J.J. Van Bavel. Changing Identities to Change Society: Leadership as a Contest for Influence and Collective Mobilization, E. Subašić, K.J. Reynolds, M.S. Mohamed. Advancing the Psychology of Change, K.J. Reynolds, N.R. Branscombe.